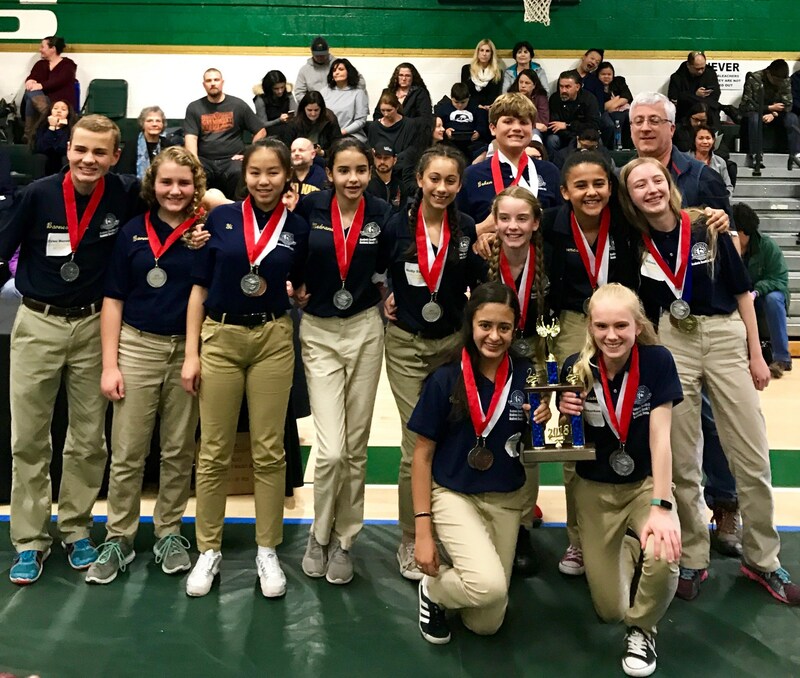 On March 3, students from Tulare and Kings Counties competed in the Diocese of Fresno’s 22nd Annual Catholic Schools Academic Junior High Decathlon. Students from the Catholic School of Visalia’s George McCann Memorial in Visalia, St. Anne Catholic School in Porterville, and Mary Immaculate Queen Catholic School in Lemoore were included. 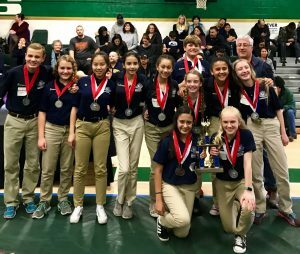 Members of Catholic School of Visalia’s George McCann Memorial in Visalia took the overall team academic decathlon competition during the junior high competition in Bakersfield. The team advances to the state finals to be held the end of April in San Diego. Courtesy of Kelli Toledo. The annual event, for students in grades 6-8, was held at Garces Memorial High School in Bakersfield. Students from 10 additional schools located between Merced and Bakersfield also participated. The competition involved 10 events for team and individual competitions. Two were collaborative team efforts – a logic quiz with 20 rigorous thinking problems and a super quiz with 50 multiple choice questions on five broad academic themes. The remaining eight events tested individual knowledge of the Roman Catholic doctrine, English, literature, science, mathematics, current events, social studies and fine arts (art and music). Teachers, parents and staff mentor students and work together for months to prepare for the contest. This year, the group of 10 students representing the Catholic School of Visalia’s George McCann Memorial took top honors overall in the team competition for the first time. Records dating back to 1997 show that this win puts Visalia in an elite group with past local winners, including St. Aloysius Catholic School in Tulare (1998) and St. Anne Catholic School in Porterville (2000 and 2007). St. Francis Catholic School in Bakersfield, placed second overall in this year’s competition. The winning team members from Visalia include: Tyler Barnes, Luke Boken, Eileen Fiss, Citlali Gomez, Ashlyn Medrano, Kari Pendegraft, Kate Richardson, Natalia Rodriguez, Holly Toomey and Tong Yi. Kayla Barnes served as the alternate. The team also placed 2nd in logic and 3rd in super quiz. Team members recognized in the individual competition were Eileen Fiss, who placed 1st in science, and Tong Yi, who placed 3rd in math. The Visalia team advances to the state competition April 28 in San Diego at Cathedral Catholic High School. The team will compete against winning teams from throughout California, including those from the Diocese of Los Angeles, Orange, Sacramento, San Bernadino, San Diego, Santa Rosa and San Francisco. I am the editor of the Diocese of Fresno Catholic newspaper, the Catholic Life. I would like permission to publish this wonderful article in our Easter edition of Catholic Life that will be printed this Wednesday, Mar. 21.